Next week, I am starting a new adventure! I will be joining Spotify, as Head of Social Media, APAC. I am a huge fan of the brand so this new role is incredibly exciting for me. When Spotify was launched in Singapore last April, I immediately signed up as a premium user. It has a massive – and growing – catalogue of more than 20 million songs. Aside from the big names from the US and UK, you can also find Singaporean artists such as Plainsunset, Corrinne May, my talented ex-colleague Tay Kexin and her sister Kewei. Since its public launch in 2008, Spotify has been leading a revolution across the world, shifting the music industry’s focus toward streaming as a way to combat illegal downloading. My role will be focusing on building social marketing capabilities in Asia, shaping how Spotify communicates and engages with music lovers through social media. I had the opportunity to speak with some really passionate and inspiring people at Spotify and I really liked what was shared about the company. Extra perks – some of the offices have been known to host private concerts by popular artists! I am off to New York next week for orientation and to spend some time with the team. Who knows, I might bump into some unexpected famous faces. I also want to take this opportunity to thank the amazing people I worked with in my previous role at SingTel. As the saying goes “There is no ‘I’ in team but there is in WIN.” Together with our agency partners – especially the team at Social@Ogilvy – we had some great successes. I had so much fun working on the award-winning #Need4GSpeed real-time social marketing campaign and had a total blast being part of the Gordon Ramsay VS #Hawkerheroes brand campaign. 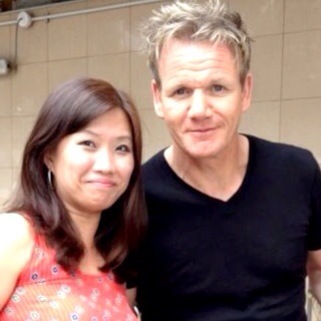 The bonus – I get some cool close-up shots with Chef Ramsay! I am looking forward to starting my exciting new journey with Spotify! If you have any thoughts or suggestions on how we can add value to each other’s work, feel free to drop me a note. If you are already a Spotify user, you know where to find me! This entry was posted in Life Stories, Technology & Digital and tagged career, music, singtel, socialmedia, spotify by Priscilla Tan. Bookmark the permalink. Congratulations, Priscila. Spotify is revolutioning the music industry for good, and it´s a great time to be part of the crew. What’s up, I check your blog regularly. Your writing style is witty, keep up the good work!